Icantdance » Blog Archive » My room. I have wallpaper! I went for the Nova Dawn from ISAK. It looks very lovely. My floor is being laid next weekend, so I have to wait another week until I can sneak into it with all my stuff. I’m in need of storage things. Shelfs and things. And I still don’t have PS, feeling so empty. 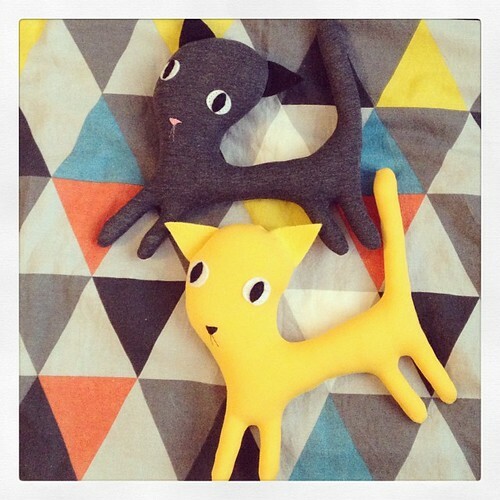 I have to include these cats, I made them for Joni (my brothers kid). She’s been talking a lot about my cats so I thought it would be perfect if she could have them at her house as well. They are just more well behaved than the real ones. This entry was posted on Sunday, January 19th, 2014 at 22:06	and is filed under Days. You can follow any responses to this entry through the RSS 2.0 feed. You can leave a response, or trackback from your own site.